I’m honored to be on the committee for Mikva the Musical, a joint collaboration between Nishmat and Raise Your Spirits Theatre, by and for women, about the mikve experience. 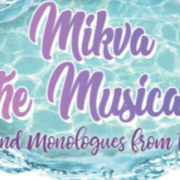 Mikva the Musical – Music and Monologues from the Deep will be performed on Sunday, January 6, 2019, in Nishmat’s Rohr Hall, 26a Berl Locker, Jerusalem. A VIP Pre-Reception starts at 7pm and the show starts at 8pm. Tax-deductible sponsorship opportunities (including ad in playbill, VIP seating, admission to reception) are still available! http://jewishintimacy.com/wp-content/uploads/2018/12/mikve-the-musical.png 217 428 Abby http://jewishintimacy.com/wp-content/uploads/2018/11/RedLogo.jpg Abby2018-12-26 23:36:132019-01-14 11:13:18Mikva - the Musical!